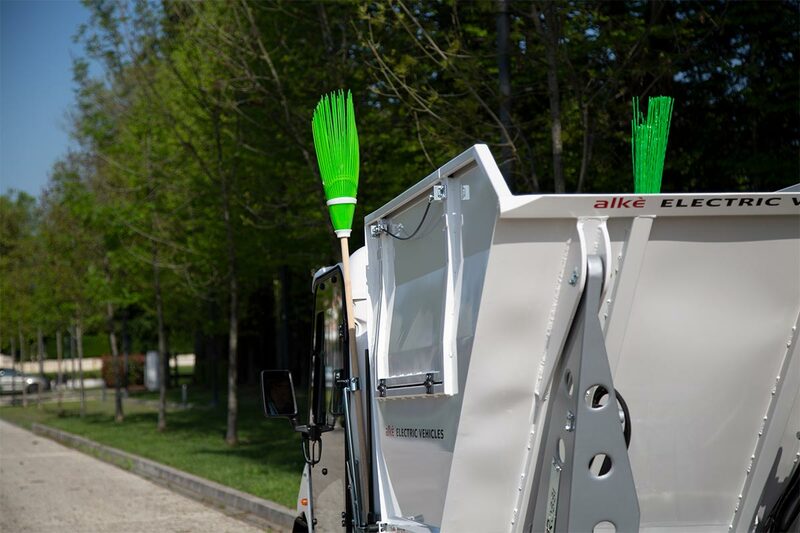 The ATX range of Alkè electric vehicles includes a special vehicle equipped with waste collection body, designed for use in cities and towns, sport centres, railway stations, airports, camping sites and tourist villages. 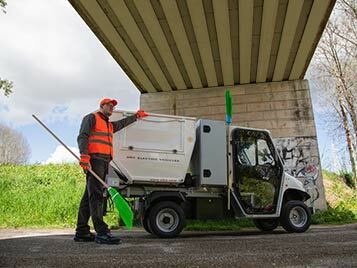 Alke' waste collection vehicles are certainly a valid answer for those organizations that aim at eco-sustainability and at reducing air and noise pollution. In this period there is much talk of smart cities that can improve the quality of urban life through activities that mainly involve the fields of mobility, the environment and energy efficiency. 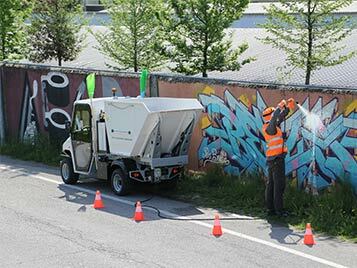 This is why more and more urban realities are being activated in the implementation of separate waste collection systems also with the help of low environmental impact vehicles. 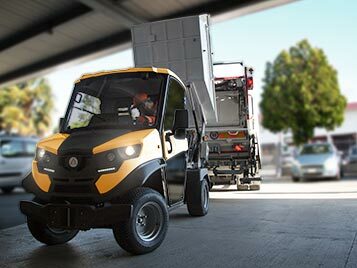 Alke municipal waste transport electric vehicle. 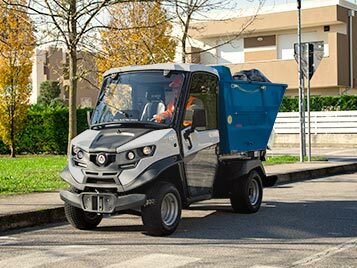 Waste body: this electric vehicle has a waste collection body of three different sizes: 2.8 m3, 2.2 m3 e 1.7 m3 (for COMBI versions) in a corrosion-resistant aluminum with a tipping angle of 90° that allows the waste to be dumped directly into the auto-compacting machines. Side door on both sides. 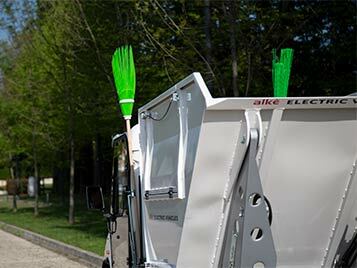 Side door: thanks to the side door, loading baskets bags and garbage bags is much easier. 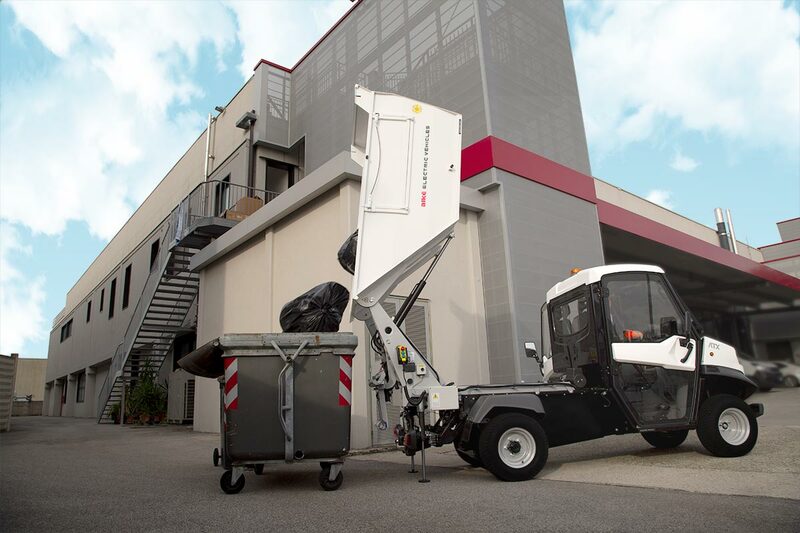 Optional bin lift: it is possible to equip the Alkè waste collection vehicle with a bin lifting system for containers of 120, 240 or 360 liters. AC motors provide very high performance while saving energy, therefore lower consumptions. Energy recovery during the braking ensures high safety standards and perfect descent maneuverability, as well as a lowering consumptions. The maximum range is indicative and evaluated over flat path with use in optimal conditions, ECO mode with proper style and energy saver guide, max speed of 30 km/h, non continuous use (batteries discharge in 5 hours). 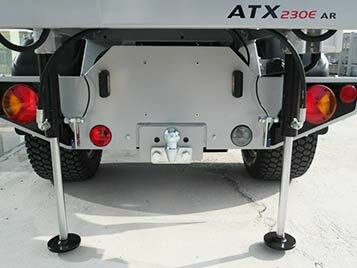 The small width allows to operate in restricted area. ATX models, in their category, are probably the only electric vehicles able to maintain high performance even in presence of slopes and difficult land-types. 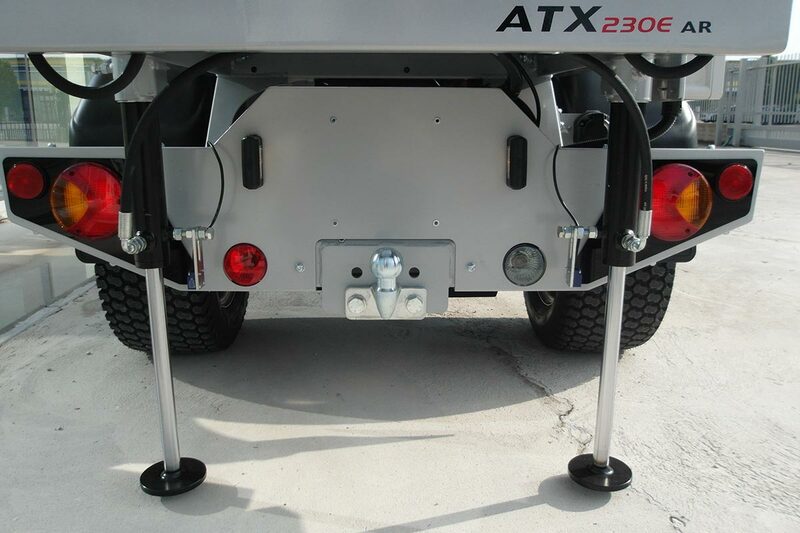 The vehicle is equipped with a dropping control system using automatic valves and double effect hydraulic cylinders and support feet with stabilization functions for tipping operations. Tipping operations can be controlled on board or with a cable command from the outside. 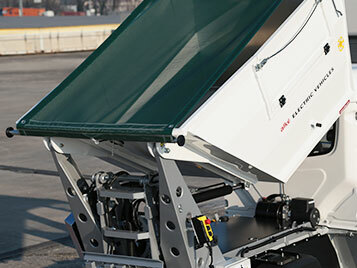 It is possible to equip the Alkè waste collection vehicle with a bin lift system for containers of 120, 240 or 360 liters, also the bin lifting system works through an electro-hydraulic mechanism and is equipped, moreover, with a kinematism that keeps the bin always in a vertical position, emptying it automatically only when it reaches the loading mouth. 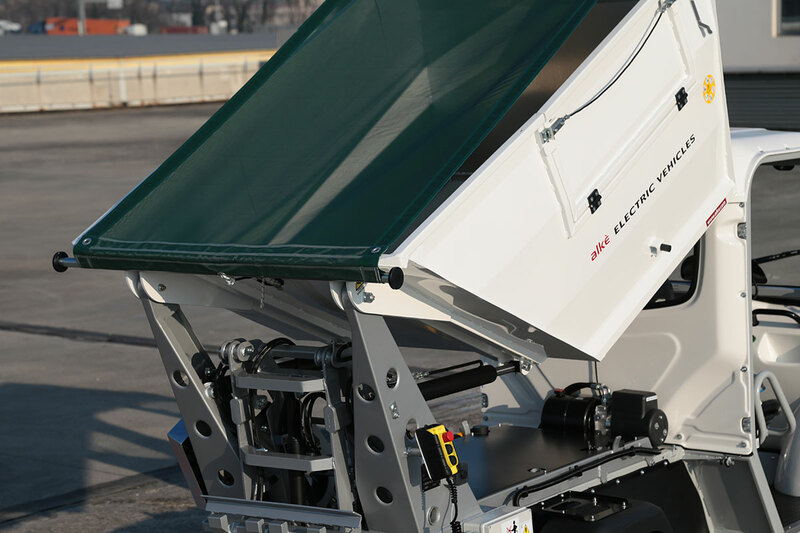 A waste collection body tarp can be installed as an option. 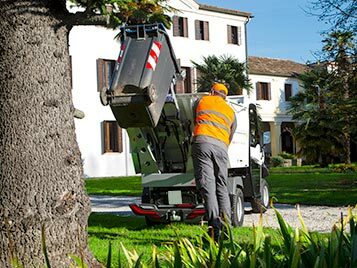 The average amortization time of an ecological waste collection vehicle is about three years, due to the absence of fossil fuels. 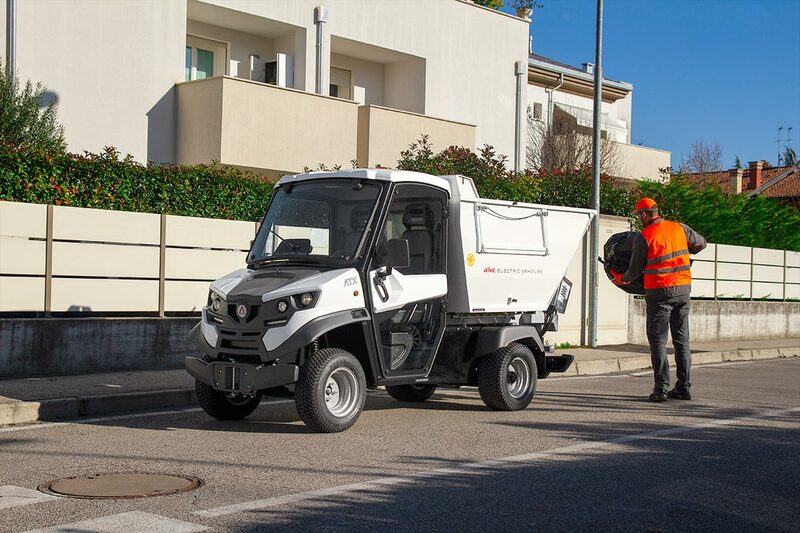 The waste collection body is also in the COMBI version (da 1.7 m3) in combination with the toolbox or the pressure washer. 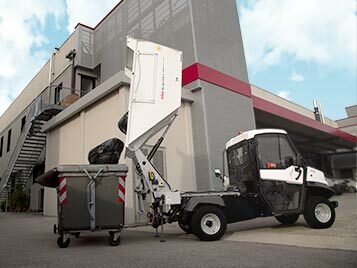 Municipal solid waste collection vehicles with bin lift. Regeneration braking: this vehicle has the regenerative brake. 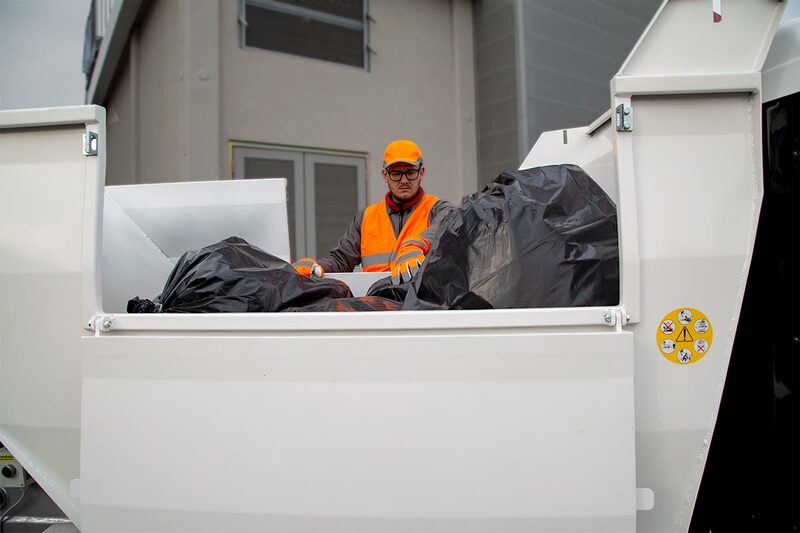 For waste collection vehicles, energy recovery is extremely important for stop-and-go movements and increases the range up to 30%. For this reason, these vehicles are chosen by the municipalities. 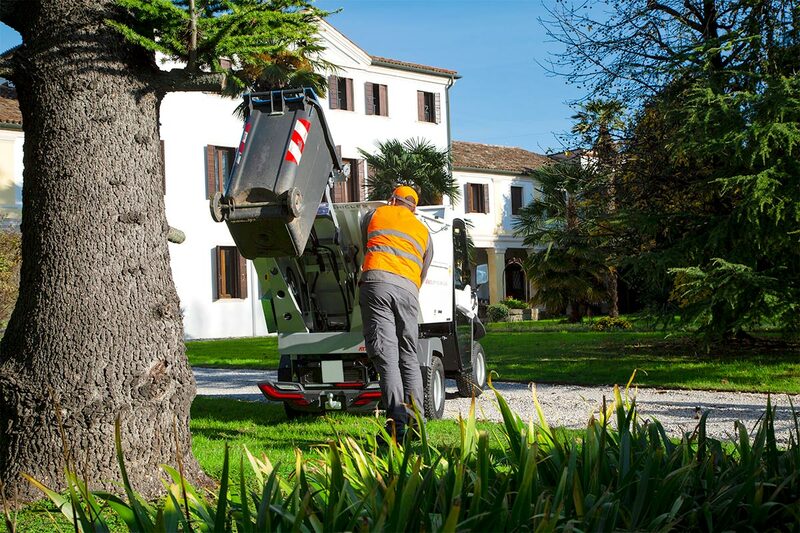 Ideal for campings and municipalities: thanks to their quiet, such vehicles are used, very often, in railways stations, parks and hospitals to load the garbage and bring it to the compactor. Alkè waste collection vehicle with body lifted up. 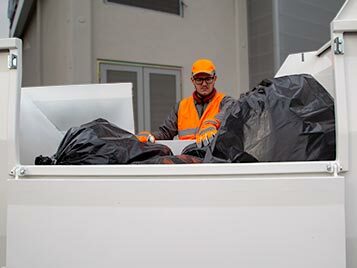 Cab controls: the waste collection body can be controlled directly on board. 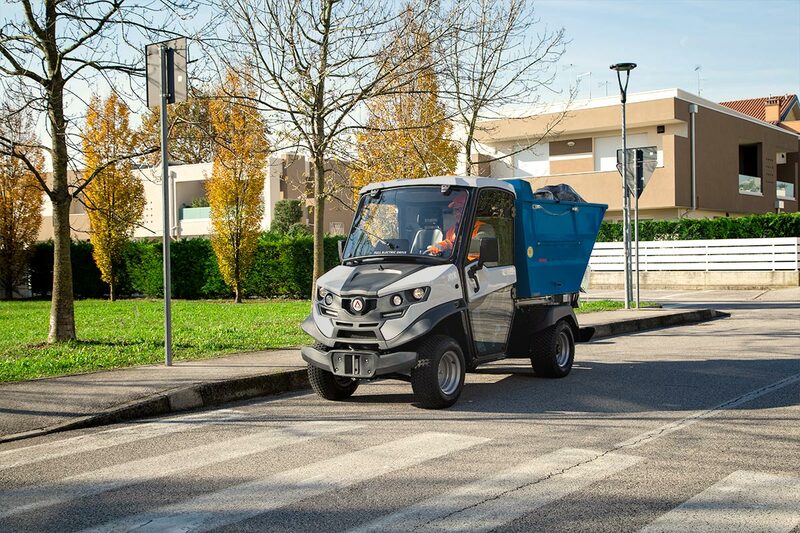 The ATX for waste collection is an electric vehicle used where it is necessary to collect waste in a continuous and easy way, without creating noise (zero noise) or polluting (electric motor). 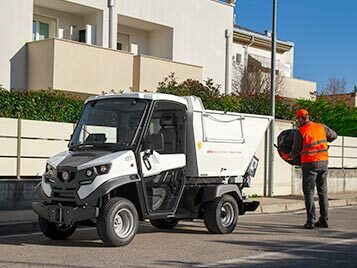 The model recommended by Alke' for the configuration with waste collection body is the ATX 340E/ED/H for the usual use but it is also compatible with the ATX 330E/ED/H model. 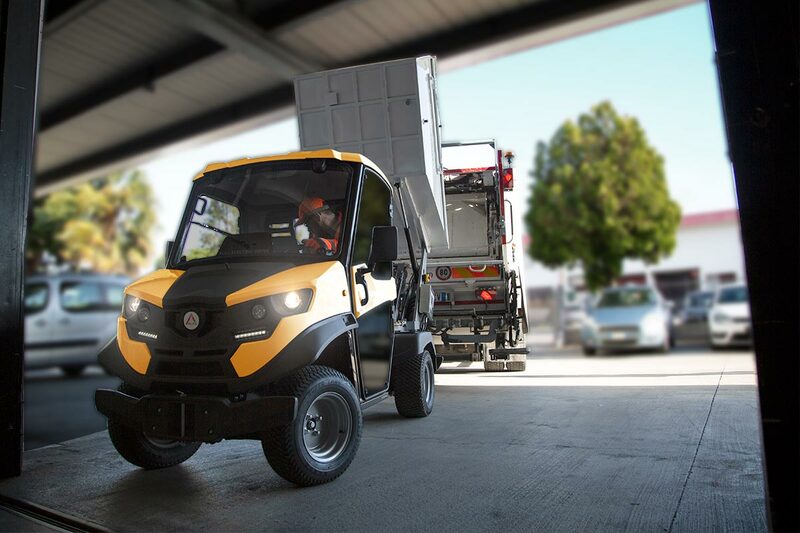 You can check the technical characteristics of the waste collection electric vehicle.